This fish belong to the family of Acanturidi, from the Caribbean Sea.  Its size is medium or large, it is colorful and very sturdy, adapted to living with reef fish of other races but rarely with other Acanturidi of different color, never with its similar or either with A. Glaucopareius or A. japonicus. Like the other Acanthuridae, it is a gregarious fish but it can easily become aggressive with other members of their own species in the limited space of an aquarium; This fish is very active and requires a lot of space for swimming. The blade to the base of the tail can inflict cuts very deep, it should be handled with caution. Herbivore, it must be fed with vegetable-based food, seaweed and blanched vegetables.